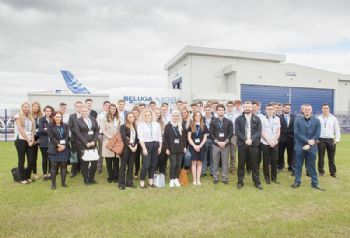 Airbus (www.airbus.com) has welcomed its largest number of apprentices in decades, as 140 young engineer and support-function apprentices began their journey at the aerospace giant’s Broughton site last month. Paul McKinlay, Airbus senior vice-president and head of the Broughton plant, said: “Airbus apprenticeships have proven to be a highly successful springboard for those wishing to pursue a career in the thriving aerospace and aviation sectors. Gavin Jones, head of early careers at Airbus in the UK, said: “An apprenticeship at Airbus offers paid on-the-job training and invaluable work experience, all while being able to further your education to either national diploma or university degree level. "The value of our apprenticeship programme speaks for itself, with so many going on to extremely successful careers in aerospace and aviation.